Like anything that a child learns, telling the time is a process. Before they can even grasp the idea of what the numbers on a clock might mean, they need to relate it to sequences of events. With Benni, my wife and I made it a point to talk about ‘when’ we were going to do things. For example, if we were going to the park ‘later today,’ Benni would know that we were going to the park before we went to bed that night. By describing the time in segments like “yesterday”, “now” and “tomorrow” it teaches kids the basic concept of time. It helps them learn what time describes and put things in a linear, chronological order. Most parents have some type of routine for their child. By establishing routines for the activities that your child does throughout the day, it also helps develop a sense of time. For example, your toddler might know that they play in their room for a little bit after lunch and then take a nap. 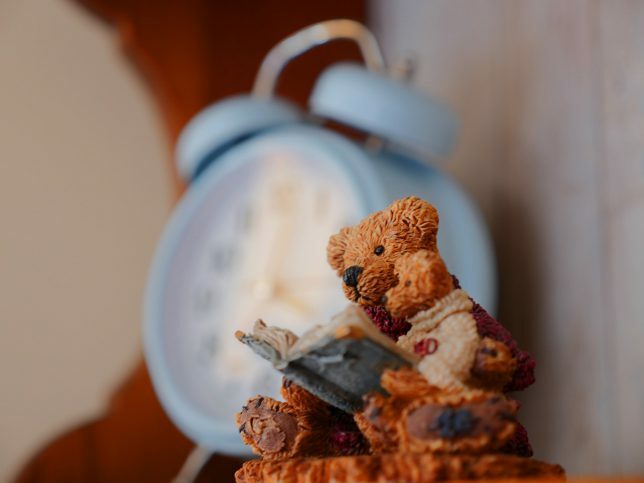 I have also discussed the importance of routine in the context of getting your toddler asleep in the evening in another article here. Familiarizing your child with words like “o’clock” or “minutes” can also help them grasp what time is. Use the vocabulary with something that is familiar, like the routines. For example, “We are leaving the park in ten minutes” or “Snack time is at 2 o’clock”. Once your child can read numbers, it can be tempting to teach them about time using an easy-to-read digital clock. Unfortunately, this creates an obstacle that you will have to overcome in the future. 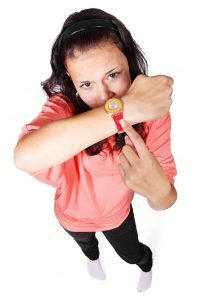 Your child may also be more stubborn about learning to read the analog clock since they already can read the easier version. One thing that digital clocks and timer can simply not communicate is the concept of “progress” and “amount of time”. They show time in the very abstract “language” of numbers. An analog clock, watch or timer, on the other hand, shows how time progresses by moving physical pointers. It is kind of an ever-changing image, and kid’s (even toddler’s) brains can work with that much, much better than with bare numbers. One timer that does this particularly well is the Time Timer Plus. A timer that visualizes the amount of time that is remaining until the timer is up by simply showing a red disc. The more red there is, the more time is remaining. My wife and I use this timer in all sorts of situations to teach Benni about time. And he can work with this representation of time VERY well! If this sounds interesting to you, please make sure to read my full review of the Time Timer Plus here. Until this point, we have discussed how you can teach your kid about the basic concept of time. 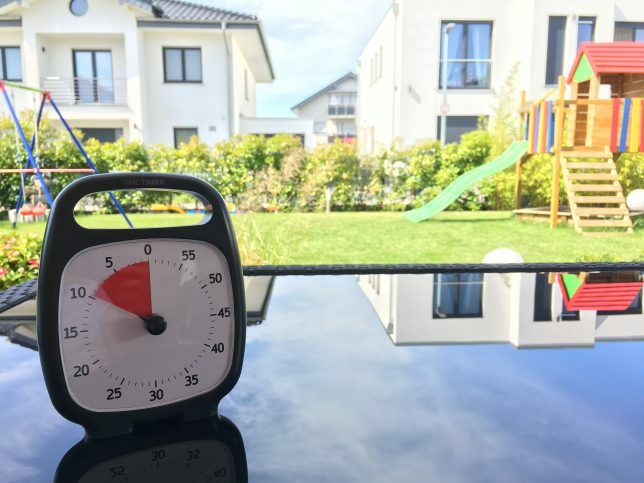 What time feels like, how time goes together with daily routine and how you can teach your kid about a certain amount of time by using analog clocks and timers. But really telling the time is a different story. Before you can even think about teaching how to tell the time, your child has to be able to read numbers. 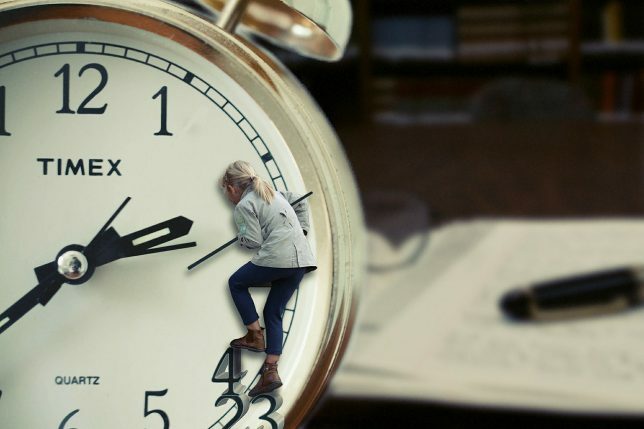 Getting up to twelve is okay for teaching hours—but they will need to count up to sixty once it is time to learn minutes. If they have reached this milestone and have grasped the concept of past, present and future, they may be ready to learn about the different parts of time. Once your child has a grasp on time, it is important to teach hours first and then minutes. If you break it down into minutes before your child understands hours, it can be more difficult for them to learn. One of the best ways to teach hours is to make (or buy) a large clock with moving hands (again: avoid digital ones here). Help your child cut out pictures that correlate to the hours on the clock and what they are doing in their routine. For example, place a picture of carrots and ranch dressing or a banana next to the two if you have snack time at 2 o’clock. This will help your kid to connect the meaning of time with what they do at that time throughout the day. And it also helps them to further develop a day-to-day routine! Once you are ready to teach your child about minutes, be sure that they can count by fives. As they learn to identify the different increments with the numbers on the clock, they will be able to tell time more easily. After they have grasped the concept of each number representing five minutes, you will be able to break it down into one-minute intervals. If counting to sixty is really hard, you could also add in another step where you teach your kids about the idea of “quarter past”, “half past” and “quarter to”. For some kids, this may work better than going to the exact number of minutes right away. Here is a fun video I found on YouTube that you can watch together with your kid to teach them how to tell time. Now for the fun part: The best way to learn a new skill is through fun and play. Let’s see how we can bring fun to the idea of how to teach kids about time. One of the most difficult concepts for children to grasp is that the numbers represent the hours and the minutes and that each has a different number associated with it. For example, the number two represents 2 o’clock, as well as 10 minutes after the hour. Create a clock with “secret identities” by making flaps that can be opened to reveal the minute increments under the main numerals. As your child learns how long each segment of time is, let them decide how long they are going to eat lunch or play. Guide them in setting up activities for the day. Then, set a timer for each of them and when it goes off, move to the next activity. While life would certainly be more carefree without time, it is a necessary part of sticking to a daily schedule. By teaching your child to tell time at a young age, you are giving them the tools they need to excel in other areas as well. Time is a complex topic and should be taught gradually. By making learning fun and correlating it to the activities of your child’s life, learning time can be enjoyable rather than a hassle. What is your favorite way to teach your kids or grandkids about time? Do you have a favorite game, book, toy or other “tool” that you used and that I forgot about? Please let me know in the comments below. For now, I wish you tons of fun and good luck as you teach your little ones about how to tell time! Hi Chris! This is my second time stopping by your site, and I’ve enjoyed each visit. Both articles have offered very helpful parenting information. I have two kids: one is 1 and the other is 11. They’re in two completely different spectrums of telling time. With the one year old, she’s still trying to understand terms like “later” or “coming back” or things like that, but keeping a routine does help her understand there’s a pattern. With my 11 year old, he is in middle school, and he’s to the point where he understands the sequence of events quite well. I practice holding him accountable to time management and giving him tasks where he independently keeps himself informed of time. I have schedules around in the house that he follows and things like that, and his school does the same. Telling time is definitely a process like you said. Even as adults, there’s still quite a few of us that struggle with time management, so it’s good to get the kids started young. Great article! 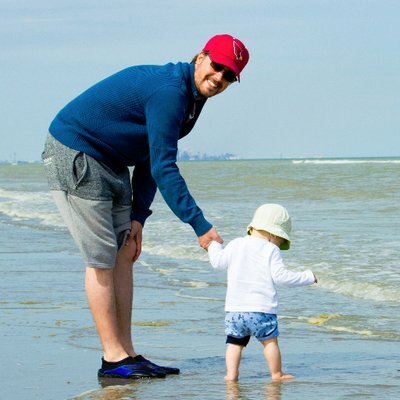 Chris, Congratulations on your awesome post about how to teach the time to your child. I find it very surprising to really find a way to teach the time to children that don’t even know how to read by focusing on daily activities. I would never believe that kids or toddlers could learn the time even if you set up games to do that. For me i think i got to know the time when i fully know how to read and count numbers till 100. I learn great things today by only spend this short time to read your post. I know something to start with my baby when he starts to speak. thanks a lot for reading my article and taking the time to leave a comment. I highly appreciate it! I agree with you that being able to count is certainly an important skill when it comes down to *telling* the time. But *understanding* time in terms of time periods and having a feeling for it (“How long does half an hour feel?”) is certainly something you can start teaching toddlers, that I have no doubt of. And my own son is proof of that theory. It works, and it has turned out to be highly beneficial when it comes down to the quality of our family life! I am somewhat surprised that you are posting about teaching time to children. I haven’t really thought about that from a developmental context. I don’t remember how I or my brothers learned about time, but I do remember when my mother taught me to tie my shoes. Also, I don’t remember when we taught our daughter about time. Or if we did. I suppose my wife did the heavy lifting on this issue. On the other hand, as an ESL teacher, I often teach older kids how to tell the time in English. Some of them have great difficulty using “face clock” as you have detailed. Great post. I like idea of giving the numbers “secret identities”. I’ve been teaching my son the time recently and found the minutes to be a real stumbling block. I have a toy clock that I made to teach him and I think I’ll go ahead and add those “secret identities” – love it! Great post! You are right, life would be more carefree without time, but it is essential to our lives. I think the process you explained is very clear and easy to follow. Start with the vocab, counting, reading numbers, and then teach how to read a clock. Excellent post, thanks for the tutorial! 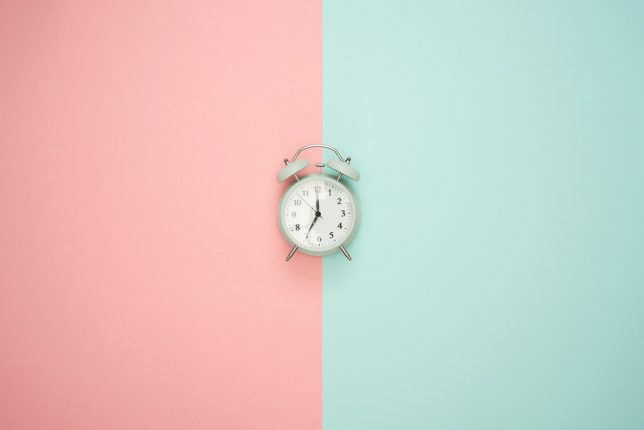 Great article on how to teach kids about time. Lots of wonderful advice provided. My daughters are both teenagers now but I remember working to teach them about time. Something that proved critical for me and my wife was the routine aspect. I used to leave my parent’s a checklist for putting my daughters to bed when her and my dad would babysit. My mom would roll her eyes and let me know she thought I was over planning for a night time ritual. She didn’t laugh about as much when she couldn’t get my daughters to bed. By them learning that after dinner we do this, then we have a bath, then we brush our teeth, then we read a story, then it’s bedtime they understand how time progresses. I was surprised to find that, unknowingly, was teaching my kids time by using time-specific words like you had mentioned. The reason behind my using them was because I didn’t want to use baby language or use different words for things. I’m gonna try those games with my 4-year-old this weekend!